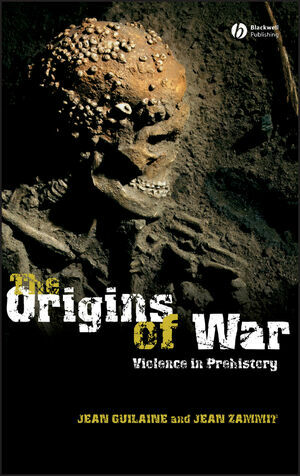 Stretching across continents and centuries, The Origins of War: Violence in Prehistory provides a fascinating examination of executions, torture, ritual sacrifices, and other acts of violence committed in the prehistoric world. Written as an accessible guide to the nature of life in prehistory and to the underpinnings of human violence. Combines symbolic interpretations of archaeological remains with a medical understanding of violent acts. Written by an eminent prehistorian and a respected medical doctor. Jean Guilaine is Professor of Archeology at the Collège de France and the École des Hautes Études en Sciences Sociales. He is the author of numerous books, including Prehistory: The World of Early Man (US translation 1986). Jean Zammit is a doctor and paleopathologist at the École des Hautes Études en Sciences Sociales. Melanie Hersey is a translator specialising in the social sciences. She has studied German, French, and anthropology and received an MA in translation from Durham University. Bloodshed at the Beginning of History. War: An Ongoing Feature of Literature and Religion. War in Prehistory: From the Garrigues of Languedoc to the Temples of Malta. Violence and Aggression Prior to Mankind. Was There a Palaeolithic “War”?. Ritual Warfare and War between “Great Men”. Prehistoric Man: Neither Violent Brute nor Innocent Lamb. 2. Violence in Hunter-gatherer Society:. Suspicious Disappearances in Charente (France). Violence in the Artwork of the Quaternary Era. Sicily: Torture in 10,000 BC?. From the Throwing Stick to the Bow and Arrow. The Enemy: Mutilated and Tortured. 3. Agriculture: A Calming or Aggravating Influence?:. The Neolithic in Europe: A Peaceful or Dangerous Conquest?. Fontbregoua (France): Another Case of Cannibalism?. Neolithic Art, the Medium of Violence?. Battle Scenes in the Sierras of the Spanish Levant. Hunters and/or Farmers in Confrontation. 4. Humans as Targets: 4,000-8,000 Years Ago:. The Contrasting Geography of Violence. A Progressive Intensification of Conflict?. War upon the Plateaus of Southern France?. The Difficulties of Making an Assessment. Did Collective Burial Sites Sometimes Serve as Communal Graves?. Lessons from the San Juan Ante Portam Latinam Burial Site (Alava, Spain). 5. The Warrior: An Ideological Construction:. The Importance of the Male. Accompanying a Man in Death. A Full Quiver: For Hunting, for Fighting or for Show. Menhir Statues: The First Armed Steles. From Mount Bego to the Italian Alps. Open Villages and Fortified Settlements. 6. The Concept of the Hero Emerges:. The Warrior Becomes a Feature of Barbarian Europe. The Sword: King of Weapons. The Orient: Chariots in Battle. The Development of a Cavalry. Tracing the Footsteps of Heroes. Steles: Marking Combatants for Posterity. Mutilated Bodies Preserved in Peat Bogs. Examines such acts of violence as executions, massacres, torture, and ritual sacrifices.